It is now nearly one month since I finished my 11 parts series of background on what is going on in Syria (Syria and Vladimir Putin: The Butcher of Homs Part 1-11). So I thought it would be appropriate to give an update of what has happened or not happened since then. And surprise, surprise – NOTHING HAS CHANGED. The same old same old. The barbaric slaughter of civilians, including children continues unabated. While’s the rest of the world talks, make statements, have meetings etc. And yet Assad hangs on, slaughtering his own people, destroying and despoiling whole neighbourhoods, calling the bluff of the Arab League, Turkey, UN, USA and EU/NATO. As for the do nothing as usual UN, it “proudly” upholds its tradition of doing ABSOLUTELY NOTHING when it really maters, like Rwanda, Somalia, Sierra Leone, Darfur, Bosnia (Srebrenica anyone?) etc. So very shortly, here are some observations. “Supervisor: Brigadier General Mohammad Anis, serving in the role of Deputy Commander of the 67th Brigade, Commander of Tank Battalion 11. Implementer: Staff Colonel Ali Khalouf, head of Reconnaissance Brigade #67, Tank Battalion. He also looted homes and stole personal property. He personally raped the wife of a Colonel who was killed by internal security in Taldo. Colonel Habib Mohammed, Battalion Tank Commander. He carried out the bombing. Colonel Mohamed Nasr Khaddam, Commander of the Shabiha groups. He stole personal property and set fire to homes. He drives a Toyota Double Cabin pickup truck painted in camouflage colors. Captain Tamam Rahija, platoon leader and shabih who stole houses and cars. Lieutenant Shaher Ibrahim, a platoon leader and shabih who stole cars and robbed houses. Lieutenant Colonel Nidal Salman, Commander of a Tank Company; responsible for the Taldo checkpoint. He robbed houses, stole cars, and raped women. Lieutenant Colonel Ali Jahani, Company Commander and leader of secret patrols and shabiha. He is from Al-Masoudieh village inHoms. 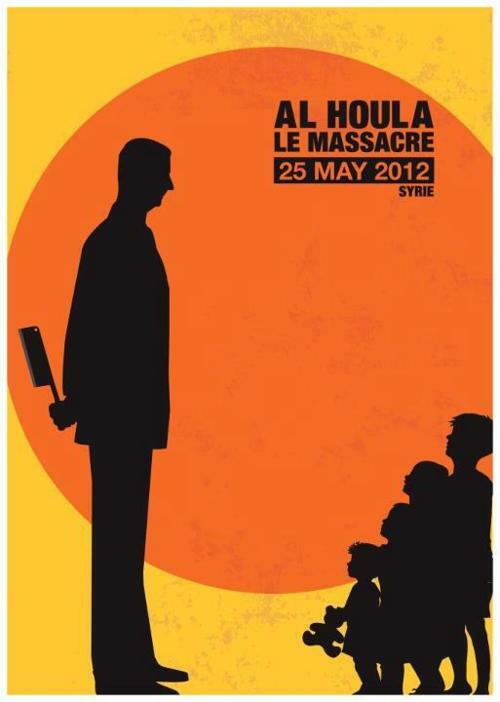 ”!HOULA MASSACRE – THE CHILDREN HAD THEIR HANDS TIED BY ASSAD’S FORCES BEFORE THEY WERE SLAUGHTERED. “The children of Houla were not killed by random shelling. The UN yesterday revealed that they were murdered one by one. The militia came in the night armed with knives and guns, and the young victims were executed with a bullet to the head or a knife to the throat. One photograph shows a cherubic baby girl, no older than 2, with a tiny gold ear-stud. She is wrapped in a white shroud. Half her skull has been hacked or blown away. A saucer of bone juts from a bloody gash in what remains of her head. Another shows what appears to be a boy of perhaps 6 or 7. The blanket in which he is wrapped has fallen away to expose a bare white shoulder. He looks as if he is sleeping, but the back of his head has been lopped off like the top of a boiled egg. His brain lies on the blanket behind him. A third shows a pretty young girl staring upwards, her mouth slightly open as if smiling. Above her right eye there is a large, bloody bullet hole surrounded by a mess of flesh and bone. 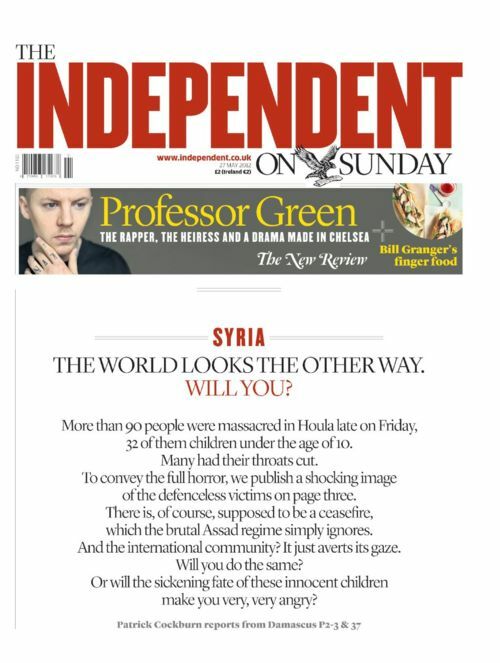 The pictures go on, some mercifully out of focus, most far too shocking to print in The Times though our failure to do so spares the Assad regime. There is a baby wearing nothing but a nappy, seemingly untouched except that it lacks an arm. Another young girl wearing a blood-soaked T-shirt with the word “Baby” or “Dolly” written on it has had her jaw shot away. A man carries the body of a child with only half a head remaining. There are children — brothers, sisters, cousins? — wearing blood-drenched shorts and T-shirts with their eyes gouged out, with their faces slashed by knives or with neat bullet holes in their torsos. One girl has had her nose and cheek sliced off. A couple of the children lying on the floor of a makeshift mortuary appear to have had their hands bound. These are some of the 49 children killed in the Houla massacre, not by random shelling but knifed to death or shot at close range by President Assad’s Shabiha thugs. They were summarily executed, the United Nations said yesterday. At least 108 civilians were killed in total, 34 of them women, in a slaughter of infants and innocents with few modern precedents. Only 20 of the deaths could be attributed to artillery or tank fire, Rupert Colville, a spokesman for the UN Commissioner for Human Rights, said. I was at home with my mother, my cousins, and my aunt. Suddenly I heard gunshots. It was the first time I heard so many gunshots. My mother grabbed me and took me to a barn to hide. I heard men screaming and shouting. I heard people crying especially women. I looked outside the window. I was peeking sometimes but I was afraid they would see me. Men wearing [uniforms] like army soldiers, green with other colors [camouflage] and white shoes, entered our house. They went outside after a couple of minutes. Then across the street I saw my friend Shafiq, 13 years old, outside standing alone. An armed man in military uniform grabbed him and put him at the corner of a house. He took his own weapon and shot him in the head. His mother and big sister – I think she was 14 years old – went outside and started shouting and crying. The same man shot at both of them more than once. Then the armed men left and the FSA soldiers came. “Russian foreign minister Sergei Lavrov said it was clear the army had used tank shells but not who shot civilians at point blank range. “Alexei Pushkov, chair of the international affairs committee of the Russian parliament, the Duma, was more explicit: “We have very strong doubts that those people who were shot at point blank [range] and were stabbed, that this was the action of forces loyal to President Assad,” he told the BBC. These are the people that Obama and his administration are basing their whole policy on that they are going to somehow “change”. 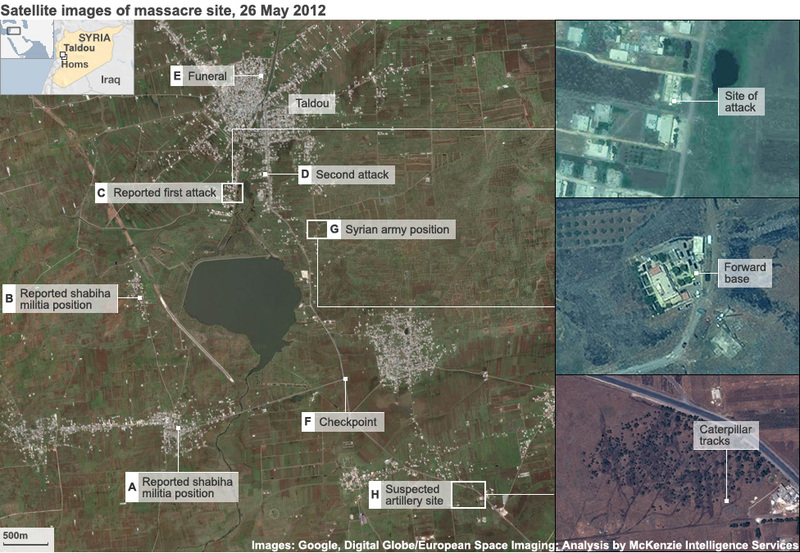 Also remember that this massacre happened under the UN/Kofi Annan and their “observers” watch. There are SOOO MANY videos EVERY DAY showing their barbaric behaviour. It’s sickening. Here are just three. LEAKED VIDEO – ”ASSAD’S FORCES RUN OVER A MAN IN THEIR TANKS – ONE AFTER ANOTHER. 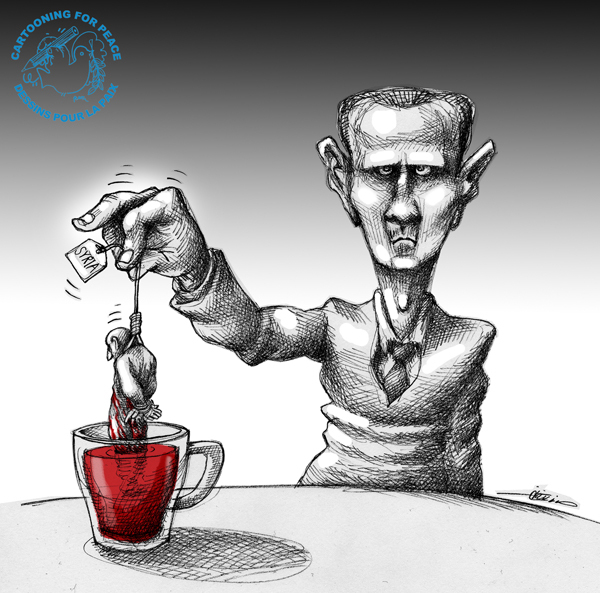 (Idleb) – Words can do no justice to the disgust and barbarity that epitomizes Assad, his forces and his supporters as they cheer and encourage such things. LEAKED VIDEO – ”HORRIFIC – A TRUE SCENE OF HELL. ASSAD’S FORCES FILM INSIDE THE HOMES OF FAMILIES THEY JUST MURDERED IN BABA AMR & JOBAR. Homs (Baba Amr) – Bodies of mutilated, burnt and crushed men and women are strewn about the rubble after Assad’s forces enter the district of Baba Amr after a month long siege where they shelled the area round-the-clock for 30 days and cut off all food and medical supplies. When they finally entered the neighborhood, the most impoverished in Homs, they went from house to house and executed entire families or anyone that dared to stay. Many of their victims had their throats slit and were burnt. LEAKED VIDEO – ”ASSAD’S FORCES FILM THEMSELVES SMILING AS THEY STAND ON THE BODIES OF MEN THEY JUST KILLED. Rastan (Date Unknown) – As is the case with many of these videos, Assad’s forces have no problems showing their faces, smiling and laughing over bodies of people they just killed. This entry was posted on 4 juni, 2012 at 9:35 e m and is filed under Fri- och rättigheter, Russia, Syria, USA, Yttrandefrihet. You can follow any responses to this entry through the RSS 2.0 feed. You can leave a response, or trackback from your own site. could think you’re knowledgeable on this subject. Well along with your permission allow me to take hold of your RSS feed to stay up to date with approaching post. Thank you a million and please keep up the rewarding work.